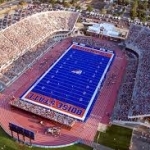 93.1 FM KTIK “The Ticket” is Boise’s exclusive 24- hour sports-talk station. 1350 KTIK is the voice of Idaho Steelheads Hockey. “Idaho Sports Talk with Caves and Prater” dominates the local Male sports audience. •KTIK Sports Update •The Scott Slant w/ Tom Scott •KTIK Traffic & Weather Reports •Idaho Steelheads Hockey (am only)•Featured NCAA Football •NFL Games Other Programming & Features In The Community As the top sports radio station for the Treasure Valley, KTIK is involved with many events like the Boise State football women’s football clinic, Hero Care, Toys for Tots, & Kids’ Fair.